We Received a Donation from the Roundtable Group in Northern KY! "Thanks to Julie Luebbers, who made a presentation to my friends in the Roundtable Group about TEN FE. Spanish for "Have Faith," TEN FE is a charity dedicated to providing an education to the neediest children in Guatemala. 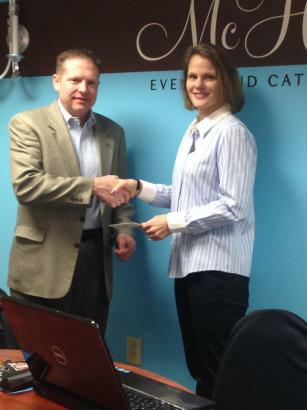 Here, my good friend Tony Milburn presents the group's second annual contribution to her efforts. Julie is to be congratulated for founding and growing such a worthy organization."